Oceanfront w/ heated pool by pier, Great fr Families. 2019 is filling up, Hurry! Welcome to "My Hiding Place", our well-appointed and family friendly inverted floor plan 4bd/3.5ba oceanfront home. The recurring theme in the guestbook comments for "My Hiding Place" seems to be: "the house had everything we needed and more!". "My Hiding Place" is located just steps from the island's grocery, beachfront ice cream shop and fishing pier/pier restaurant. Amenities include : big screen HDTV with apple TV, books, video games, board games, charcoal grill, outdoor shower (hot and cold water), beach toys, boogie boards, a beach umbrella and beach chairs. For families with babies and small children, the house is also equipped with a Pack N Play, high chair, booster chair, changing table and baby gate. There is something for every family member, younger and older! Uniquely furnished bedrooms each offer a ceiling fan and TV. The "flex" room can function as a fifth bedroom (full-size sofa bed) or a second den. The "flex" room also has a separate HDTV and a Playstation 2 with games. Outside, four covered porches with rocking and lounge chairs allow you to relax and enjoy the ocean breeze and views of Holden Beach or the island interior. Directly off of the rear porch, an in-ground saltwater pool (6' deep) with surrounding deck awaits your group. Right beyond the pool is your private dune walkway to beautiful Holden Beach, where we hope you will make fantastic vacation memories!! ***********PLEASE NOTE************** Sometimes partial weeks are available, but normally the partial needs to encompass a rental week (Saturday to Saturday); very seldom can i have a partial week reservation start on a Friday. Our family has been coming to Holden Beach for many years and loving every minute of it. We recently decided to get our own place to enjoy year round. We live in Durham, NC. My husband and I work at Duke Hospital/University respectively. We are excited to share our beautiful home with your family. It brings great joy to us learning that your family had a wonderful & memorable vacation at this house. This house has everything we were looking for. Oceanfront with pool, just the right size so everyone is comfortable, porches on each floor, oceanfront and street front, cozy and lovely. Previous owners had been taking very good care of it and we hope to do just that for us and our guests to enjoy. The house is located in the 400 unit block, close to the pier. Next door is a convenience store which comes handy if you missed a food item. One door down is the famous ice cream store which is a big hit in the Summer! The pool, usually open from March - November and can be heated, is a wonderful addition for all ages, especially the little ones who can't be in the ocean for long. Sheets for all beds and sofa bed when doing a weekly rental. Bath Towel sets provided during Prime season. Many spices, coffee filters, salt and pepper. Pam spray all provided. Table for 8 with an additional 2 bar stool at counter. Outdoor porch off kitchen with patio table and chairs. Living area has one 50" HDTV LCD Flex room has a 32" HDTV Bedrooms have small TVs mounted on wall. 2 HD TV in Living area and flex room Regular cable in all bedrooms. DVDs & VHS. Bedrooms have TVs that will play videos as well as the living room and flex room. PS2 system and games in the Flex room. 4 covered decks/porches: Upstairs street-side off kitchen has dining table. Up & down Oceanfront porches have rockers, lounge chairs and patio set. 4 Porches, 2 ocean front and 2 street front. House is called "My Hiding Place", previously known as "Changes in Latitude"
This is our second time staying at this amazing beach house. 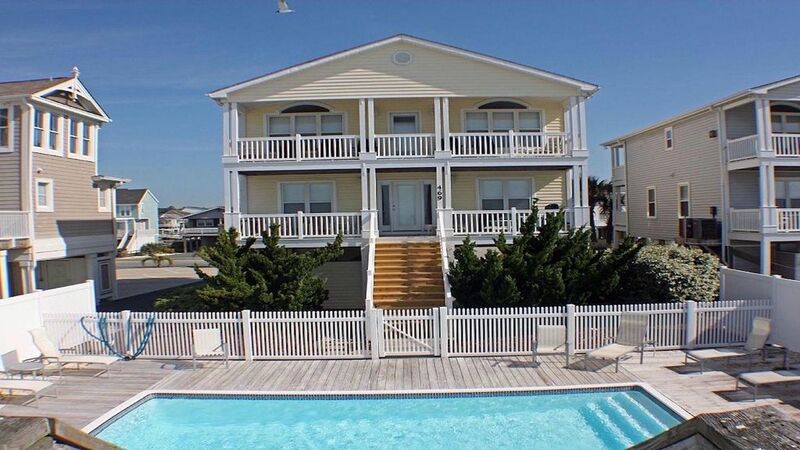 It has everything you need and convenient to the pier and general store. Our friends lived it. Look forward to next year and staying in this beautiful home. This is the place to stay at Holden! We rented this house for a week in October. It was the perfect house for a family. We had elementary and teenage kids, parents, and grandparents on the this trip, and we were all very happy with the house and the area. Everything was clean and very well organized. The manager of the house was available for questions and kept in contact with us all week just in case we needed something. The kitchen was well equipped with anything we needed to cook a meal, and the pool was a great feature when the kids got tired of the beach. Faten was great to work with, and we had everything available to us to have a great week at the beach. I hope we will be returning in the near future, and we will definitely rent this house again! Our time at My Hiding Place was everything we wanted it to be and more. Weather was incredible. General Store was great if you forgot something and it was within 50 feet of the house. We made nightly trips to Haley's Ice Cream shop next door. The home was immaculate and had everything we needed. Pool was amazing. We will be staying here again and again. This is probably the most well equipped house we have encountered throughout our vacation years. There isn't anything Faten and family left out.The house was clean, well appointed, comfortable and more than large enough for our group. We had beautiful weather during the week of October 27-November 3rd. The heated pool was a real plus. Faten and Rhonda were wonderful to work with and made recommendations for dining, etc. Loved it! Had an amazing week here with my wife, almost 2 y.o., and my parents. Plenty of space for all of us, and the pool and beach were fantastic. The owner and housekeeper were both incredibly helpful and responded quickly to all of our questions. We had a great week, and perfect weather to boot. House was perfect. Had everything we needed. Weather was gorgeous. Loved the proximity to the general store. Would highly recommend this house. Holden Beach is a sea turtle sanctuary. Turtle Talk is held every week during the summer for those interested. Sightings of turtle hatchings happen in the summer with the local 'Turtle Patrol' counting nests and hatchings, and protecting the nests. Holden Beach is located in a golf course rich area! IN addition to accidental damage insurance (required) there is a small security deposit of $250. POOL heat $350/week in 2019.